Do you have an addiction to your smartphone? I know I do! As a REALTOR®, I’m constantly checking emails and texts and thanks to my bluetooth, I can even do it while I’m on the phone! This article is courtesy of the MSN Lifestyle page, but I found it to be so true! You constantly look at it. When you aren’t around it, you feel anxious, and when you have it, it’s all you can think about. Yes, we’re talking about your smartphone. Our obsession with mobile gadgets has become epic – 1 in every 5 people in the world own a smartphone these days. And now there are a handful of new syndromes that come with that addiction. “Text Claw” is a non-medical term used to describe all of the finger cramping and sore muscles that come from continuous scrolling, texting, and gaming on smartphones. An even more common side effect: Using your phone too much can cause inflammation in your tendons and enhance existing conditions, like tendinitis and carpal tunnel. Similarly, “Mobile phone elbow” describes tingling or numbness in ring and pinky fingers after bending your elbow for long periods of time. Slouching over your phone for hours at a time is ruining your neck and hurting your back muscles. “iPosture” or “text neck” are just two of a few phrases doctors throw around to describe the excessive stress on neck muscles. According to a study of young adults in the U.K., 84 percent of those tracked experienced back pain during the last year, mainly due to being hunched over smartphones, tablets, and computers. Short for “no-mobile-phone phobia,” this is exactly what it sounds like: the fear of being without your cell. According to a study of 1,000 people in the U.K., 66 percent of the population fears losing or being without their phones at any given time. Some of the symptoms of nomophobia include anxiety or negative physical symptoms if you have lost or cannot use your cell phone, obsessively checking to make sure you have your phone with you, and constantly worrying about losing it somewhere. Interestingly, the study found that women suffer from this more than men. No, you didn’t just get a text message! A professor at Indiana University found that 89 percent of the undergraduates in her study experienced phantom vibrations when their phones weren’t actually vibrating. The study also found that students who were dependent on text messages and social media updates were more anxious when their phones weren’t really vibrating. So…do you exhibit any of these symptoms????? 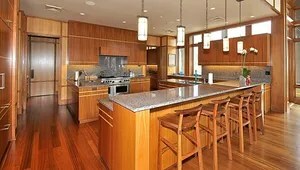 I positioned myself in the kitchen for the tour and I loved it when I heard people walk into my home and said “wow”! It’s not fancy, but it is full of character, from the wood floors to the leaded glass french doors between my living room and dining room to the bedroom turned into a dressing room, it feels good when someone recognizes the love you put into your home. Yes, some think it’s strange that I opened my home to strangers for a tour, but it is for a worthy cause as a fundraiser for the continued maintenance and care of The Benton House (click here to read more). I cannot take any credit for the amazing renovations the gentlemen who owned the property before me did, it’s stunning, I didn’t even have to paint, just moved my things in, arranged them and hung pictures, but I think that my touches is what makes it feel like a home. The decor is somewhat eclectic, a Lazy Boy camelback sofa, a roll-top desk that was my grandmothers, a wood and iron table in the dining room, antique dresser and gentlemen’s chest combined with a bit of animal print really make the dressing room interesting! My bedroom is, by far, my favorite room in the house…dark chocolate walls, red curtains and bedding with cream accents and my big, cream comfy chair that all of my nieces (and my mom) hoped wouldn’t fit! The attic is my office…taupe walls and generations of my family history detailed in black and white photos taking up nearly an entire wall, all watching me as I sit here working and hoping to make them proud. So now I know what strangers think of my home…what would they say about yours? Irvingtons’ Benton House Tour of Homes is a main fundraising activity for the House. Proceeds from past tours have helped to provide a new permanent sign in the front yard, a new slate roof, gutters and downspouts, fifty new folding chairs, a much needed trim and removal of dead trees on the grounds and foundation repairs. The Irvington Benton House Tour of Homes on Sunday, September 21, 2014 will showcase the history, charm, and architecture of Irvington neighborhoods while bringing inspiration, education, and home improvement ideas to the Indianapolis area. Celebrate over 40 years of outstanding home tours by touring an array of stunning historic homes in vibrant Irvington. Guests can enjoy viewing the properties of homeowners who truly fuel the Irvington neighborhoods. Many of the homeowners not only live in Irvington, but, invest further in the development of the 143 year old community. Central Ace Hardware, 10th & Arlington Ave.
Bookmama’s, 9 S. Johnson Ave.
Black Sheep, 5626 E. Washington St.
Dufour’s, 5648 E. Washington St. Antique Mall (Jack & Jill’s), 5501 E. Washington St.
Tickets are $15.00 the day of the tour. For more information call 317 506 6808. This year’s Tour theme: “REDEFINING LEGENDARY”! The Tour is Sunday, September 21st, from noon to 5pm. We hope to see you there! We are very grateful to the following sponsors of last years’ tour. Please click on the businesses below to go to their website. Ace Hardware ~ 1025 N. Arlington Ave.
Downey Avenue Christian Church ~ 111 S. Downey Ave.
Bookmama’s ~ 9 Johnson Ave.
I’ll be hanging out at home on Sunday talking about the wonders of Irvington…will I see you there? I had the privilege of attending a concert of the US Marine Band, ‘The President’s Own’ at Clowes recently. And, it is a privilege and an honor to see and hear these men and women share their talents. The Marine Band was established in 1798 by President John Adams with 32 drummers and fifers. In 1801 they performed for Thomas Jefferson’s inaugural and he gave them the title ‘The President’s Own’. The band accompanied President Abraham Lincoln to Gettysburg for the dedication of the National Cemetery and his immortal Gettysburg Address. In 1880, twenty-five-year-old John Philip Sousa was appointed the 17th Leader, a post he held for 12 years. In 1886, he led the Band and President Cleveland and more than 20,000 marchers down 5th Avenue and Broadway on the way to New York Harbor for the unveiling ceremony of the Statue of Liberty. The concert was free (thanks to us taxpayers!) and it was a full house. We got there early to get good seats in the balcony of course. They began with The Star Spangled Banner and ended with America, The Beautiful and everyone sang along. They also performed each of the military anthems and requested the audience to stand if they or a family member had or was serving in that branch. Thanks to my family, I am able to stand for each of them: uncles, nephews & sons have served in every branch of the military. The crowd was very appreciative and gave several standing ovations. The program announcer was also a fantastic singer and did a melody of Harold Arlen songs ending with a beautiful rendition of Over The Rainbow. The jazz selections were outstanding too. They performed “For ‘The President’s Own’” which was written for them by John Williams on their 215th. Anniversary. As an encore, the Band did ‘Raiders Overture’ and again everyone was on their feet applauding. Clowes Hall is a great venue, the acoustics are amazing. Only drawback is having to get up and down to let people in and out because there is no middle aisle. We sat in the back row of the balcony so there was plenty of leg room and no one behind us. The ushers, who are volunteers, kept everyone in order. The lady in our section even came over and asked the person using their cell phone to play a game to stop. Wish they’d do more of that at the movie theatre! It was a great way to spend a Sunday afternoon. In the market for a new home…got $25 mil to spare? From the Indy Star last week…amazing, the property taxes annually are more than most people’s first home price! Asherwood, the lavish Carmel estate where Mel and Bren Simon and their family lived for many years, is for sale for $25 million. The seven-bedroom, 51,000-square-foot house sits on 106 acres that includes two swimming pools, tennis courts and a private 18-hole golf course, according to www.mibor.com. Like to be outside? The lot also includes a clubhouse, greenhouse, pool house, and guest house among other maintenance buildings. Prefer the indoors? There’s one indoor pool, an expansive workout room, home theater and caterer-ready professional kitchen in the home where presidents have been wined and dined. The property tax on the estate is $54,654 semi-annually, according to the website of the listing Realtor Natasha Radovich with Carpenter. 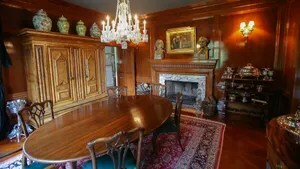 The home also includes six fireplaces, eight full bathrooms and 16 half-baths. It is the most expensive residential property on the market here in recent years, said Claire Belby, a spokeswoman for the Metropolitan Indianapolis Board of Realtors, or MIBOR. Since 2000, 72 properties have been listed for $10 million or more. But only four of those have been residential; the majority were for commercial land or agricultural properties. Simon and his first wife, Bess, bought the Asherwood home and property in 1973. Automotive engineer Louis H. Schwitzer built the original estate. Over time, Simon and his second wife, Bren, expanded the home, adding on a 10,000-square-foot addition that included a 4,000-square-foot master bedroom wing. But in 1998 they had to rebuild after a fire, thought to have started when a candle lit fabric-covered walls in one of the bedrooms, left much of the house uninhabitable. Mel Simon, co-owner of the Pacers and co-founder of Simon Property Group, died in 2009. The sale of Asherwood comes after the end of three years’ of litigation over his $1 billion estate, which ultimately was settled out-of-court. Deborah Simon had alleged her stepmother coerced her father into changing his will so that Bren Simon received a much larger portion of the estate. Mel and Bren Simon had multiple homes. She sold a New York condo soon after his death. In 2010, she listed their 20,000-square-foot mansion in Los Angeles’s Bel-Air neighborhood for $50 million. The price was steep even for Bel-Air. She lowered the listing to $29 million in 2012 and delisted the property in 2013. Estate properties can be a hard sell. Lucas Oil co-founder Forrest Lucas bought Stephen Hilbert’s estate at auction for $3 million in 2010 after it languished for five 5 years on the market. Built for $35 million, the 25,000-square-foot house with its 15,000-square-foot sports pavilion, swimming pools and infinity waterfall, pool house and opulent grounds, originally was listed for $20 million. The property listing dropped to under $10 million over time, but finally went to auction when no buyers stepped forward. Don’t feel like you can spend $25 mil? Let’s talk about your budget and see what we can find that’s a little more reasonable! It’s almost time for Penrod! It’s the 48th year of The Penrod Arts Fair™. Penrod is one of the nation’s largest single day arts fairs. Saturday, September 6th, 2014 on the grounds of the Indianapolis Museum of Art. This year’s fair features over three hundred artists, six stages of entertainment, more than 50 arts-related non-profit organizations, and an extensive children’s area. Also, don’t forget to visit the Indiana Craft Beer Garden! Billed as “Indiana’s Nicest Day,” it runs from 9:00 a.m. to 5:00 p.m. and is $15 per person for advance tickets and $20 the day of the fair. For a more elegant option, at $100 per person, you can get a preview at the exclusive An Evening with Penrod™ at The IMA. This is the Second Annual Evening with Penrod™ and is presented by the National Bank of Indianapolis as an exclusive preview of the Penrod Arts Fair on Friday, September 5th, 2014 from 6:00-10:30 pm on the beautiful grounds of the IMA. For all the details, click here to visit the website! So what is the purpose of this annual event? The Penrod Society is a volunteer organization, strongly rooted in Central Indiana. Their mission focuses on the cultivation, encouragement and development of public interest in and support of those arts, cultural and educational institutions located in and around Marion County, Indiana, its surrounding counties and the Central Indiana area in general. In 1967 a group of twenty two men formed The Penrod Society™. The volunteer organization was designed to support the cultural and educational activities of Indianapolis-area artists, students, and arts organizations. “Penrod” pays homage to Penrod Schoefield, a literary character from Indianapolis novelist Booth Tarkington. Over forty years later, The Penrod Arts Fair™ has become an Indianapolis tradition. Each year over 20,000 fair patrons visit the grounds of the Indianapolis Museum of Art on the first Saturday after Labor Day. The Penrod Arts Fair™ showcases hundreds of artists, and offers live music, performing arts and local cuisine. Proceeds from this one-day celebration provide grants for Indianapolis-area arts and community organizations. In addition to launching the Arts Fair, The Penrod Society™ was also instrumental in creating the Economic Club of Indianapolis and the Prelude Awards. Great event, will you be going? “Water, water everywhere . . . . .